Mr. President, the Vienna Declaration and Programme of Action (VDPA) emphasises the importance and constructive role played by National Human Rights Institutions (NHRIs) in promoting and protecting human rights. The current trends of shrinking civic space and reprisals against human rights defenders (HRDs) in Asian countries highlight the critical importance of strengthening and establishing NHRIs in Asia. Independent and effective NHRIs, functioning in accordance with the Paris Principles, are often the first line of defense against human rights violations by governments. However, we regret that independence and effectiveness of many NHRIs in the region are seriously compromised due to lack of participatory, transparent and merit-based selection and appointment processes. For example in Thailand, the National Legislative Assembly rejected five civil society nominees for the National Human Rights Commission in a secret vote. In Myanmar, the appointment of three new Commissioners was announced through a short statement on the Facebook page of the President’s Office with no details regarding the selection process. We call on Asian governments to ensure the formalisation of transparent, merit-based and genuinely participatory selection and appointment processes in legislation or appropriate regulation. 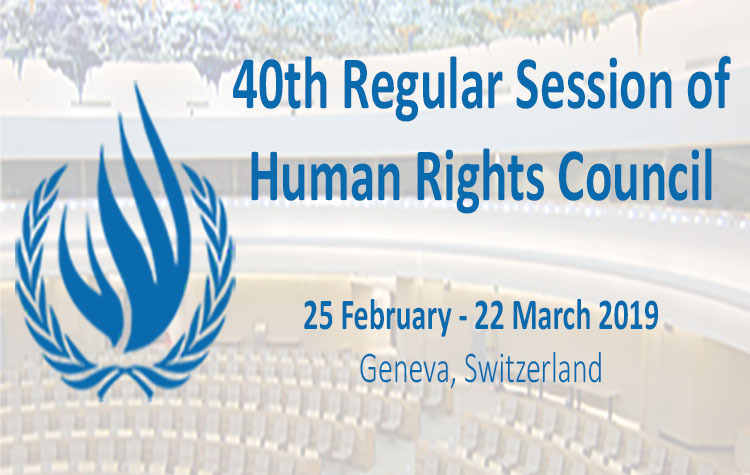 We welcome the Marrakech Declaration adopted by GANHRI in October 2018, and call on NHRIs to act proactively in accordance with the Declaration, especially on the protection of HRDs. We are deeply concerned at the silence of the National Human Rights Commission of India amid the ongoing crackdowns on human rights defenders across the country. We reiterate our call on the Commission to take timely and appropriate action in accordance with its mandate to protect HRDs. Finally, we condemn the recent intimidation and reprisals against the Human Rights Commission of Sri Lanka. We call on all Asian states to create a safe and conducive environment to fully safeguard the independence and effectiveness of NHRIs. Thank you.